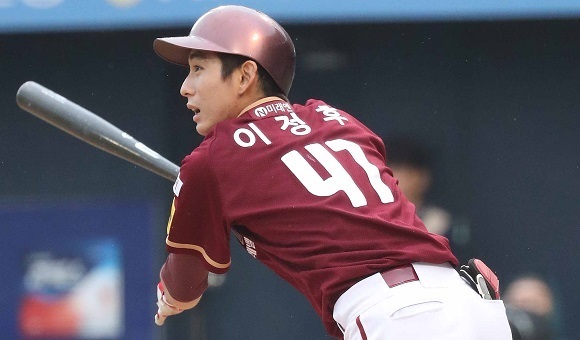 Hot-shot young guns have emerged as unlikely stars in the first half of the Korea Baseball Organization season, with the All-Star break just around the corner. At the plate, few rookies have been as impressive as Nexen Heroes' Lee Jung-hoo, who won't even turn 19 until August. Before the season, Lee's biggest claim to fame was being the son of retired KBO legend Lee Jong-beom, former league MVP and Rookie of the Year. The junior Lee is batting .331 to lead all first-year players through Sunday's games and is tied for eighth overall with 100 hits. Last year, Lee Jung-hoo was drafted in the first round by the Heroes, and the Lees became the first father-son duo to be selected in the first round of the KBO draft. At this rate, they could also become the first father-son combo to win the KBO's top rookie honors. The younger Lee has been voted in for the All-Star Game on Saturday, and when he takes the field, Lee will become the youngest ever to play in the mid-summer classic. Lee has been a part of one of the KBO's most consistent offenses. The Heroes have a 44-38-1 (wins-losses-ties) record to rank fourth -- in position to make their fifth straight postseason. They also have the KBO's second-highest batting average (.301), second most runs (469) and second most hits (883), all this despite getting virtually no production from their import hitter, Danny Dorn. On the mound, Kia Tigers right-hander Im Gi-yeong has put some forgettable years behind him to emerge as an important starter for the best club in the league. The 24-year-old started his career in 2012 with the Hanwha Eagles but made virtually no impact over the course of the next three seasons before starting his mandatory military service. Even Im has acknowledged that he had a questionable work ethic in the past, and he didn't put in the kind of effort that he should have with the Eagles. Im joined the Tigers as a compensation player when the Eagles signed former Kia pitcher Song Eun-beom via free agency. He made his Tigers debut this year after completing his military duty, and the submarine pitcher has been a revelation. After starting the season in the bullpen, Im made a spot start in early April and has not left the rotation. Im is 7-2 with a 1.82 ERA over 74 1/3 innings. He also leads the KBO with two complete game shutouts. Only four other pitchers even have one shutout. Im doesn't have enough innings to qualify for the ERA title because he hasn't pitched since June 7 while dealing with pneumonia. Im is scheduled to return this week.